Steven Bryan Johnson, born January 12, 1956, started playing guitar in 1963 after his Uncle Mickey Johnson played his electric guitar for him. Played in rock blues bands in California until moving to Ann Arbor, Michigan in 1982. There he met Albert Collins, Willie Dixon, Luther Allison, Duke Robillard, Johnny Winter, and lots of Chicago and Detroit area blues players. Moved to New York City in 1983 and formed The Tanks, a Blues Power Trio and recorded 3 albums all independently released in the U.S. Played with Paul Butterfield, Johnny Copeland, Paul Schaeffer, Albert Collins, Little Jimmy King, Jaco Pastorious, Little Mike, Popa Chubby, Big Ed Sullivan, Jon Paris and most New York Blues players. 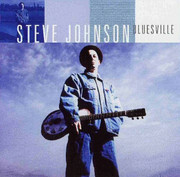 Steve Johnson Winner of Guitar Player’s 1993, "Ultimate Guitar Competition - Blues Category".